XAT Syllabus 2019 Pdf: Xavier Aptitude Test (XAT) is a national-level management test conducted by XLRI on the behalf of XAMI. Candidates who are thinking to give XAT 2019 that is scheduled on 6 January should first check the exam pattern and XAT Syllabus to obtain the qualifying marks in the exam. 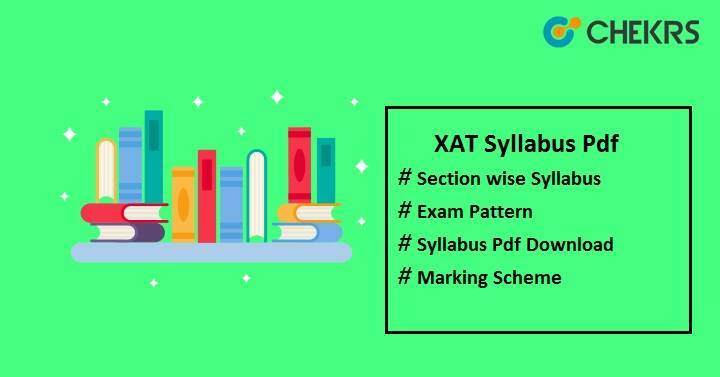 After knowing the syllabus of XAT, candidates are required to know the XAT Exam Pattern. It will help you to know the overview of question paper. To get familiar with the XAT exam paper, candidates are advised to check the exam pattern before appearing for the exam. XAT Test Pattern will give idea about the time duration for each section, marks slotted to each section, marking scheme, mode of examination, etc. The pattern of paper will be decided by the official authority. Take a look over the XAT Entrance Exam Pattern 2019 for better preparation. Marking Scheme 3 marks for each correct response. -1 will be deducted for wrong attempt. Each question carries one mark and for each wrong answer there will negative marking of 1/4 (0.25) marks. Zero marks will be allotted for unanswered question. But after 12 questions that have not been attempted there will be negative marking of 0.05 marks for each unanswered questions. You Can also check XAT Previous Year Question Papers and process to download XAT Admit Card from our seprate Article. We are also having tranding FAQ on our landing page Here XAT 2019 and we will update all articles as per the new updates. So Keep visiting and Do Well.